With features like majestic scenery, historical sites, interesting museums and the world’s top scientific center, what more could you ask for in an ideal travel destination? Read more to learn about Geneva’s attractive offerings. A must do in Geneva is its gorgeous Lake Geneva. Surrounded by scenic mountains, the lake presents a magical atmosphere. You can opt to take a boat ride across the lake or just enjoy walking. There are lovely parks around the lake where you can relax and take in the scenery or capture photo shots. There are also many shops and restaurants scattered around the lake as well. It doesn’t matter whether or not you’re interested in physics, CERN is a fascinating place to visit, although tours need to be booked in advance. CERN, the European Council for Nuclear Research, is the world famous research center that focuses on learning how the universe works. A tour allows you to learn the history of the center and its progress as well as the opportunity to see important scientists at work. Built in 1891, Victoria Hall is a beautiful, old concert hall with great acoustics where you can enjoy a wide range of musical concerts. At the Museum of Natural History, you can spend hours touring the four floors that feature fascinating exhibits of birds, animals, reptiles, sea creatures and insects as well as dinosaur fossils, rocks, minerals and meteorites. The museum also offers a lovely courtyard and restaurant. The St. Pierre Cathedral is well worth a visit. Though significant for its history and the religious leaders who have preached inside it, the church building itself is a beautiful sight with its elegant interior and high arched ceilings. If you climb the stairs to the bell tower, you will be rewarded with stunning views of the city. Additionally, you can check out the ongoing archaeological site that is present underground the church. The archaeological researchers have discovered that the site of the church dates back to more than 2,000 years to the Roman period. You can check out the artifacts and historical information that is available at the site. 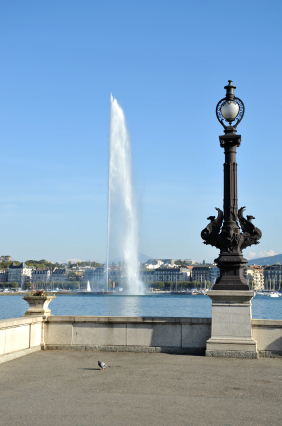 You can’t visit Geneva without taking a look at the Jet d’Eau. As one of the city’s most popular attractions, the Jet d’Eau is a large fountain that jets out 132 gallons of water every second up to 459 feet high into the air. It is an impressive sight that captivates visitors every day. Caution: if you visit on a windy day, you could get wet! If you enjoy outdoor markets and the thrill of a good bargain, you’re in for a treat in Geneva. This city is host to numerous markets that range from farmer’s markets to flea markets. The Plaine de Plainpalais is the city’s largest outdoor flea market that is held three times a week. You can find a wide assortment of goods here from food and housewares to paintings and antiques. The Place du Molard is a daily market where you can buy a variety of flowers. At the Place de la Fusterie, you can find unique crafts handmade locally. Begin planning your trip to Geneva today by checking out the many hotel deals that are available and securing your reservation.